Official recognition of work performed by The Louisiana House of Representatives Webteam & Divisions since 1999. Once again, the LLWC's website shows innovation with a new modern and mobile look and feel. In 2017 The LLWC website was re-designed with a brand new look, specifically to make it mobile friendly. The LLWC site can now be seen on any device. Come visit us. Showing a modern look and feel, in 2016 The Acadiana Legislative Delegation's website was re-designed. One of the new features for the site is that the site is now mobile friendly. Come visit us. Louisiana Legislative Republican Delegation. Re-Design. 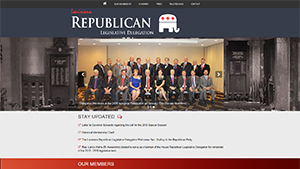 Featuring the same mobile friendly and a modern look and feel aspect as the Acadiana Delegation's website, the Louisiana Legislative Republican Delegation's website was re-designed in 2016. Come visit us. LLBC Louisiana Legislative Black Caucus. Re-Design. 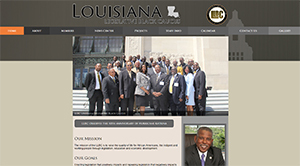 In 2015 The Louisiana House Webteam redesigned the Louisiana Legislative Black Caucus website displaying a more modern and cleaner look. Sales Tax Streamlining and Modernization Commission. 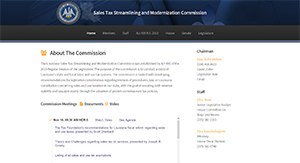 In 2015 the House Webteam was tasked with providing a website in a very limited amount of time for The Louisiana Sales Tax Streamlining and Modernization Commission. The new website was provided displaying a modern and clean look. The website utilizes a template making the site fully mobile. 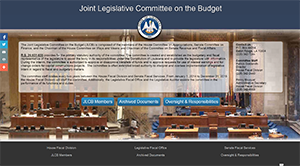 In 2014 The Louisiana House Webteam was asked by the House Fiscal Office to redesign the website for the Joint Legislative Committee On The Budget . This site is now being redesigned and will be given a new and fresh look. 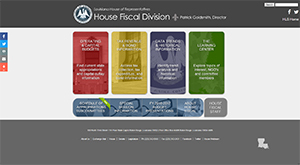 At the end of 2013 The Louisiana House Webteam was asked to redesign The House Fiscal Division's website. This site is now live and can be seen here. 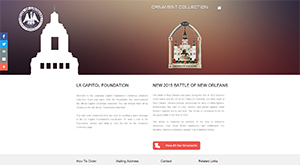 Soon after the 2013 Regular Legislative Session, the House Webteam was asked to design a new site for the Louisiana Capitol Foundation's Ornament Christmas collection. The site was successfully launched soon after and the public can now browse the ornaments for sale by the foundation. In the summer of 2012 The Louisiana House Webteam was tasked with the design of a new Web site for The Newly formed Louisiana Revenue Study Commission. Concurrent Resolution SCR 103 from the 2012 R.S. established a Revenue Study Commission which reviews tax expenditures. The site was completed in August and you can now see the site In Action here! 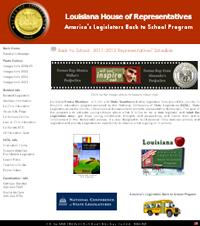 In 2010 The Louisiana House Webteam was asked to design a new Web site for Redistricting 2011. In late 2009 and early 2010 The Committee on House & Governmental Affairs, Members of the Legislature and Staff Members realized a series of State wide tours or Regional Public Hearings on Redistricting Process & Law Relative to 2011 Redistricting Again in early 2011, the Committee on House & Governmental Affairs and The Senate and Governmental Affairs Committee toured the state for a series of 9 regional redistricting meetings. See the Site In Action here! 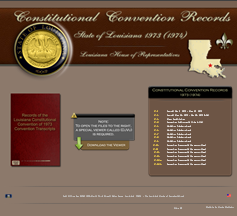 In September 2009, The Legislative Research Library asked the House Webteam to build a website dedicated to the Constitutional Convention Official Records of the State of Louisiana for 1973 (1974). 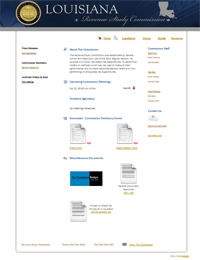 The result, a website containing Journals, Verbatim Transcripts and Convention Documents by Committee. 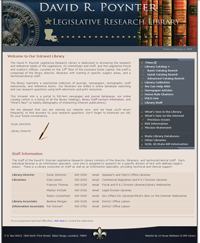 In December of 2008 the Louisiana House Webteam was asked to re-design a new Web site for the David R. Poynter Legislative Research Library. In conjunction with the Leadership and the Library staff, the LA House webteam re-designed a site that will help the Library maintain a substantial collection of journals, newspapers, monographs, staff memoranda, and reference books. The David R. Poynter Legislative Research Library is dedicated to answering the research and reference needs of the Legislature, its committees and staff, and the Legislative Fiscal and Auditor’s Offices. Located on the 13th floor of the Louisiana State Capitol, the staff is composed of the library director, librarians with training in specific subject areas, and a technical/clerical staff. In the fall of 2008 the Louisiana House Webteam was asked to design a new Web site for the newly formed Capital Region Legislative Delegation. In early 2008, the Capital Region legislators recognized the opportunity to bring both tenured and freshman members of the House and the Senate together for the purposes of building a cohesive working group that could affect positive results for the region. While each member maintains representation of their district's priorities, the Delegation works as a coalition to elevate those priorities that are regional in nature to the next level. Thus the delegation was formed to serve as a central voice of constituents who live, work and play in the Capital Region. See the Site In Action here! See the Site In Action here! 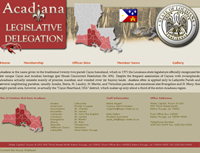 In February of 2008 the Louisiana House Webteam was asked to build a website for the Acadiana Delegation. 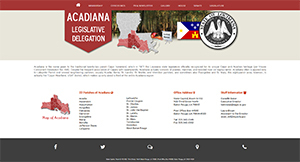 In conjunction with the Delegation's administrator, the LA House webteam built a website that will help the Delegation post their news, press releases and events. See the Site In Action here! Acadiana is the name given to the traditional twenty-two parish Cajun homeland, which in 1971 the Louisiana state legislature officially recognized for its unique Cajun and Acadian heritage (per House Concurrent Resolution No. 496). Despite the frequent association of Cajuns with swamplands, Acadiana actually consists mainly of prairies, marshes, and wooded river (or bayou) lands. The Louisiana House Webteam once again gets charged with the great honor to build a website for an outside entity. 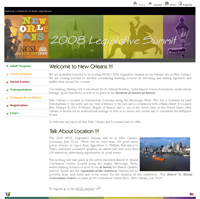 In conjunction with NCSL, the LA House webteam built a State Host site for the Legislative Summit held in New Orleans June, 2008. We are incredibly honored to be hosting NCSL's 2008 Legislative Summit in our vibrant city of New Orleans. We are looking forward to another outstanding meeting, focused on educating and uniting legislators and staffers from around the country. The Louisiana House Website once again gets recognized for a feature called worth stealing See item 19 on The State Legislatures Magazine's Article. "The Louisiana Commission on Civic Education requested the Clerk's Office the webteam designed and maintained a new website. The Louisiana Commission on Civic Education's mission is to promote civic engagement by a responsible citizenry and to encourage the building of partnerships to enhance the teaching and learning of the principles of representative democracy in the state of Louisiana. 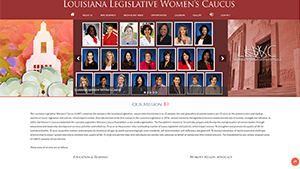 "The Louisiana Women's Caucus requested the Clerk's Office the webteam designed and maintained a new website. The Louisiana Legislative Women’s Caucus (LLWC) comprises the women in the Louisiana Legislature, whose collective mission is to: (1) prepare the next generation of women leaders and (2) serve as the premiere voice and leading monitor of issues, legislation and policies, which impact women. Since the election of the first woman to the Louisiana Legislature in 1936, women elected to the legislature have increased dramatically in number, strength and influence. Salt Lake City, Utah - Eight research reports will be honored by a staff section of the National Conference of State Legislatures for their excellence in exploring topics of contemporary interest to legislators and staff. NCSL's Legislative Research Librarian (LRL) staff section presented its Notable Document Awards at NCSL's 30th Annual Meeting in Salt Lake City. Eight reports from five states were selected. 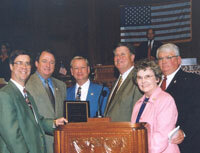 The Louisiana House of Representative was honored today with the inaugural Melvin Dakin Open Government Award. The award was presented to the House of Representatives for opening the legislative process for “the average citizen.” The award was presented by Common Cause/Louisiana, a statewide organization that actively promotes openness and accountability in government. The award is named for LSU Law Professor Melvin Dakin who was a charter member and long-term leader of Common Cause/Louisiana. In all his work, he advocated an open government that represents the interests of all citizens. Professor Dakin recently died at age 93. Louisiana House Members will join with State Senators and other legislators from around the country in this civic education program sponsored by the National Conference of State Legislatures (NCSL). State Legislators across the country visit schools and classrooms to promote representative democracy. The goal of the program is to educate young citizens about what it is like to be a state legislator and what the Legislature does, get these young constituents' thoughts and perspectives, and inspire their active involvement in the democratic process. It is also designed to build personal links between schools and legislators and provide Legislators an opportunity to observe what is going on in schools. The Digital Legislatures Survey is the first study of its kind that will be used as a bellwether for electronic government and provide models for best practices. In August, all 50-state legislative offices were invited to participate in the survey. Officials responded to a set of 12 questions and ranked their offices according to a four-point scale, providing URLs and background data for final verification and validation. Questions ranged from online access to legislation and elected officials to legislative technology support and operations. A ranking was established based on the multiple-choice criteria selections. 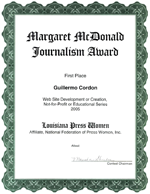 In June 2002, The Louisiana House Webteam once again gets charged with the great honor to build a website for an outside entity. 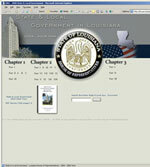 "The judges of the Eagle E-Government Awards program evaluated the joint Legislative Web site for Louisiana by also visiting the House and the Senate sites that were linked to the joint Web site homepage"
"The Louisiana Republican Legislative Delegation requested the Clerk's Office the webteam designed and maintained a new website. 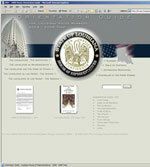 "The Louisiana Legislative Black Caucus requested the Clerk's Office the webteam designed and maintained a new website. The primary purpose of the LLBC is to raise the quality of life for African Americans, the indigent and working people through legislation, education and economic development.